No.8 Wayne "Buck" Shelford captained the All Blacks in the late 1980s and was part of the squad which took the 1987 World Cup. After playing for the Bay of Plenty Secondary Schools, Shelford lined up for Auckland and when North Harbour Rugby Union was created in 1985 he moved there. After impressing at provincial level, Shelford made his All Blacks bow against Club Atletico San Isidro in Buenos Aires on October 12 1985. However, he had to wait until 1986 to earn his first Test cap which came against France in a 19-7 victory in Toulouse. In the second Test - the "Battle of Nantes" - Shelford went down in rugby folklore after ripping his scrotum and losing four teeth before asking the physio to stitch it back up and continuing to play. However, he was later forced to leave the field after being knocked up but it was his uncompromising attitude and lack of self-preservation which made him a fans favourite. The All Blacks - incidentally - lost the Test 16-3. In 1987 Shelford won a World Cup winners medal having played in five of the six games during the tournament, including the final. Shelford then assumed the World Cup captacincy following the tournament and under his rein - 1987 to 1990 - the All Blacks did not lose a single game. Shelford will also be remembered for teaching his team-mates the proper version of the 'Ka Mata' Haka which the All Blacks still perform to this day. In 1990 the All Blacks selectors deemed Shelford unable to continue for the national side and he was dropped after the Scotland Test series. And despite widespread supporter pressure for Shelford to be reinstated in the side, Shelford never regained his place. However, he did captain the New Zealand XV which played Romania in the then Soviet Union. 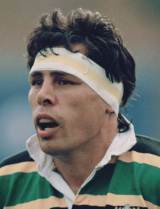 Shelford retired from rugby in 1995 after a spell at the Northampton Saints in England and Rugby Roma in Italy. He went onto coach Saracens and Rugby Lions before returning to New Zealand to coach North Harbour. In June 2007 it was announced that Shelford faced the biggest battle of his life after being diagnosed with a form of cancer labelled lymphoma. He made a full recovery from the disease.